The Rhode Island Unemployment Insurance and Temporary Disability Insurance Law is an unemployment law poster by the Rhode Island Department Of Labor and Training. This is a mandatory posting for all employers in Rhode Island, and businesses who fail to comply may be subject to fines or sanctions. This poster must be posted in a conspicuous place by all employers so that all employees can see it. This poster describes how to file a claim for unemployment, how to get employment and training services from the government and how to get temporary disability insurance benefits. It appears you don't have a PDF plugin for this browser. 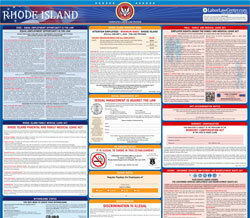 Please see the link below to download rhode-island-uitdiposter.pdf. Employment Security Act and the Temporary Disability Insurance Act. within seven days of your layoff date. 2. File your claim online at www.dlt.ri.gov/ui or by telephone at (401) 243-9100.
visit www.dlt.ri.gov/ui or call (401) 243-9100.
address and telephone numbers of your employers for the last two years. If you are not a U.S. citizen, your alien registration number is required. d. You must register for work with the RI Dept. of Labor and Training. occurs or within the calendar week prior or subsequent thereto. 3. You earned enough in qualifying wages to be monetarily eligible. www.dlt.ri.gov/tdi	 or call (401) 462-8420. Tax Section, One Capitol Hill, Suite 36, Providence, RI 02908-5829. 1. Job referral and placement services. 3. Career counseling and testing to help assess aptitudes and interests. 4. Internet access for employment and training information. 5. Job Search workshops to help you develop interviewing skills. services online at 	www.employri.org	. determine to be necessary to administer the Employment Security Act and Temporary Disability Insurance Act. Such notices shall be posted in conspicuous places where the workers’  services are performed.